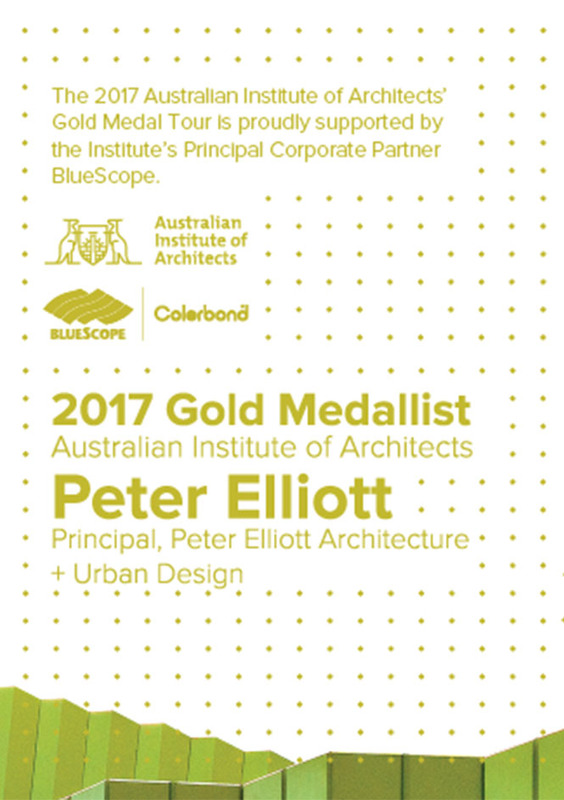 The Australian Institute of Architects and RMIT Architecture + Urban Design are pleased to invite you to the 2017 Gold Medal Tour address. At the 2017 National Architecture Conference in Sydney, Peter Elliott of Peter Elliott Architecture + Urban Design, was announced as the 2017 Gold Medallist. ‘Distinguished by his capactity to navigate the complexities of public commissions with diplomacy and tact while ensuring that the highest design standards are sustained, his work extends beyond architecture into the realm of landscape and urban design. Peter has completed an impressive and diverse range of projects throughout Melbourne, large and small, both in his own right and in association with others. Notable projects include Victoria University Law School, Deer Park Bypass, Melbourne Grammer Memorial Hall and numerous buildings and urban spaces for RMIT University city campus. His focus on public, educational and urban projects of exceptional quality is demonstrated by his achievements in the state and national architecture awards programs, with almost annual acknowledgement since the 1970s. In all, he has been recognized with in excess of forty Institute awards and has received more than twenty other industry awards. Peter has also served the profession extensively through membership of jury panels within the Institute’s awards program. *For RMIT students and staff, please refer to your RMIT emails for separate ticketing instructions.